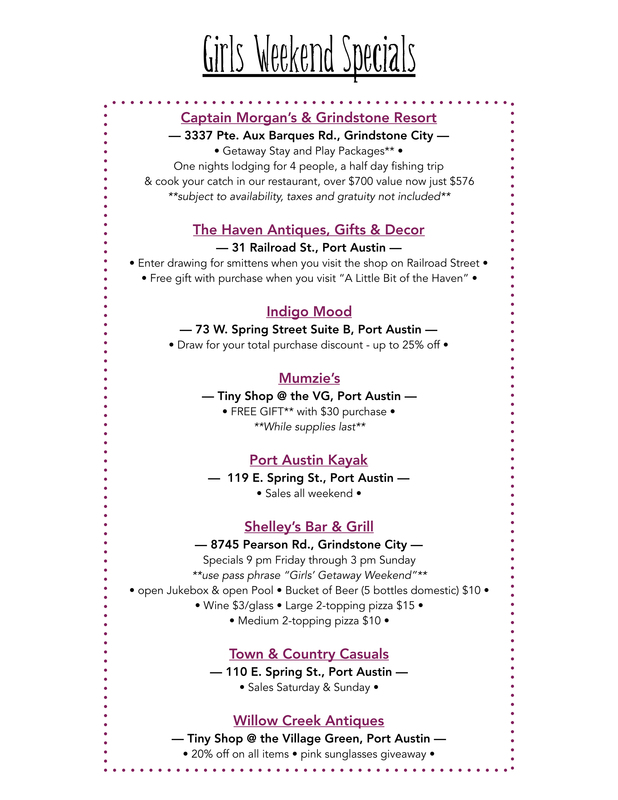 Ladies takeover Port Austin, score some deals, have some fun, and relax! The excitement is building for Port Austin's 2019 Girls' Weekend! See below for a schedule of activities, specials, & more! Every year in September ladies gather from near and far to celebrate Girls’ Weekend in Port Awesome. Plan a trip with your girlfriends and enjoy some much needed fun and relaxation. Browse the farmers market and local shops for unique treasures and goodies and find deals throughout area businesses. Enjoy fun activities, live music, a relaxing walk on the break wall and beach, and more! Special Treat for 2019! Appledore V, 65 foot schooner out of Bay City, will be gracing our harbor for Girl’s Weekend. Private tours and fundraising cruises will be sailing Friday evening as well as Saturday and Sunday. Cruises will fill quickly. Trivial Pursuit - 7 pm: show off your knowledge and WIN some prizes! Enter to win between 10 am - 3 pm! Click a business to see what specials are being offered! Captain Morgan’s Grindstone Resort — 3337 Pte. Aux Barques Rd. Heins Hardware & Lisa’s Loft — 8735 Lake St. Port Austin History Center — 1424 Pte. Aux Barques Rd. Port Austin Kayak — 119 E. Spring St.
Shelley’s Bar & Grill - 8745 Pearson Rd. Town & Country Casuals — 110 E. Spring St.